The days of inefficient light bulbs are slowly coming to an end. Recent tests from Consumer Reports showcased more than 30 different compact fluorescents and light-emitting diodes that can brighten indoor and outdoor spaces. Consumer Reports’ comprehensive report on CFL and LED bulbs revealed that many problems of the earlier versions have been overcome and these new efficient bulbs last longer and use far less electricity than incandescent bulbs. Shoppers now have a variety of different bulbs to match their needs. The label , patterned on food nutrition labels, lists the bulb’s lumens, or brightness; its estimated yearly energy cost; how long the bulb is expected to last; its appearance, from warm to cool; how much energy it uses; and whether the bulb contains mercury. Consumer Reports put a spotlight on 60-watt equivalent CFLs and LEDs, as those are the most popular. It usually takes less than a year to recoup the cost of most CFLs because of the bulbs’ lower prices. LEDs can take four to 10 years to pay for themselves because they are expensive. Also, CFLs now have less mercury. The amount in bulbs tested has dropped 60 to 75 percent, compared with already low levels in 2008, without affecting performance. Nevertheless, spent CFLs should be recycled. Home Depot, Ikea, Lowe’s, and some ACE Hardware stores accept used bulbs. The best LEDs were as bright as the incandescents they replaced, yet only half were as bright as promised. Consumer Reports found that all LEDs reached full brightness instantly, even at frigid temperatures, providing warm white light. Energy use matched or exceeded claims. LEDs are supposed to last 20,000 to 50,000 hours, or about 18 to 46 years, when used 3 hours a day. Nearly all the LEDs are still burning brightly after 3,000 hours, and only four of the 100 LEDs stopped working. Recommended LEDs include the Philips Ambient LED 12.5W 12E26A60 60W, $40 for table or floor lamps; the EcoSmart LED Downlight 10.5W 65W E26 ECO-575L Dimmable, $50, for recessed or track lights; and the EcoSmart PAR38 ECS 38 Bright White 75W 866194 Dimmable LED, $45, outdoor flood light. Recommended compact fluorescent bulbs include the GE Energy Smart-SAF-T-GARD 60W 78961, spiral, $10; the EcoSmart 60 Watt Soft White 423-599 ES5M8144, $1.50; and the Feit Electric Ecobulb Plus 60W ESL13T/5/ECO, $2, spiral. Look at lumens. Watts tell only energy use, lumens measure brightness. In spirals look for at least 450 lumens if replacing a 40-watt bulb; 800 lumens or more for a 60-watt bulb, 1,100 lumens for a 75-watt bulb; and 1,600 lumens or higher when replacing a 100-watt bulb. In floodlights look for a lumen count that is at least 10 times the wattage of the bulb replacing. Don’t confuse brightness with color. The whiteness, yellowness, or blueness of light is measured by its temperature in kelvins. Incandescents produce a warm yellowish light with a color temperature of about 2,700K. At 3,000K to 4,100K range, they give off a cool, bright white light that’s similar to a halogen bulb, and at 5,000K to 6,500K, the bulbs mimic natural or daylight. Note CRI. In addition to temperature, the Color Rendering Index indicates how accurately colors appear under the light and ranges from 0 to 100, with daytime sunlight at 100. A CRI of at least 80 is recommended for interior lights. Read the package. 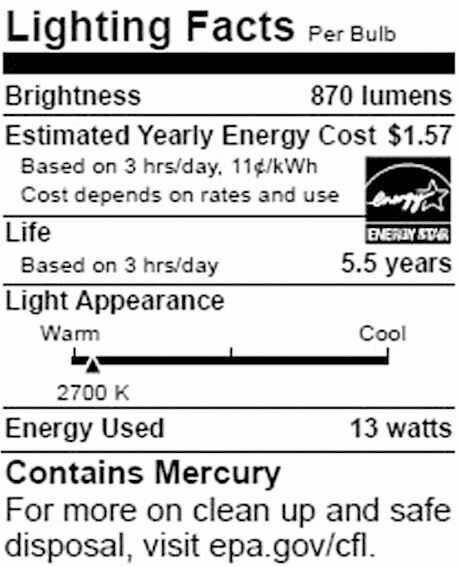 As of Jan. 1, 2012, a Lighting Facts label must appear on the packages of most bulbs to show brightness, energy use, estimated energy costs, expected life, light color in kelvins, and, for CFLs, mercury content.